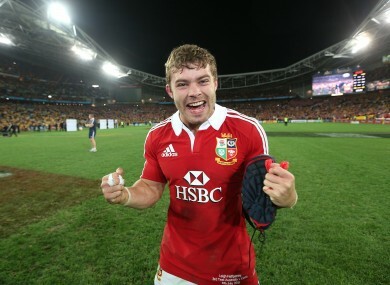 Leigh Halfpenny was Man of the Series as the Lions triumphed in Australia. THE IRB PLAYER of the Year shortlist has been announced today, with Eben Etzebeth (South Africa), Leigh Halfpenny (Wales and British & Irish Lions), Sergio Parisse (Italy), Kieran Read (New Zealand) and Ben Smith (New Zealand) all making the cut. Halfpenny has been rewarded for his influential performances for the British and Irish Lions, as he helped Warren Gatland’s side secure a 2-1 series win over Australia. Meanwhile, the news also caps a stellar year for number 8 Read, who could become the fourth New Zealand player to win the award from the past five years. Fans can cast their votes on the official RWC Facebook page, with the winner set to be announced following the culmination of the November Tests. With that in mind, who do you think deserves to win it? Email “Read and Halfpenny among the IRB Player of the Year nominees”. Feedback on “Read and Halfpenny among the IRB Player of the Year nominees”.